Adin Ballou was a pacifist, socialist, abolitionist, and founder of the utopian community of Hopedale, Massachusetts. During its 15-year life (1841-1856), the community's members labored to realize their vision of the well-lived life. In 1854, with Hopedale at the height of its prosperity, Ballou wrote Practical Christian Socialism as a handbook for people interested in starting similar communities. 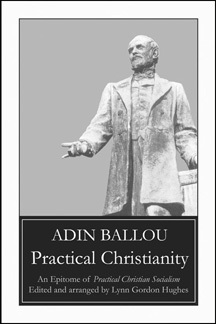 Practical Christian Socialism turned out to be Adin Ballou's most comprehensive exposition of his fundamental principles and their application to personal and community life, ranging from theology and political theory to marriage, child-rearing, and a surprisingly frank discussion of sexuality. In Practical Christianity, Ballou's 655-page treatise has been edited to eliminate the cumbersome dialogue form in which it was originally written. All of the language is Ballou's own, and nothing is omitted except a final section in which he compared Practical Christian Socialism to competing varieties of utopian socialism popular in his day.